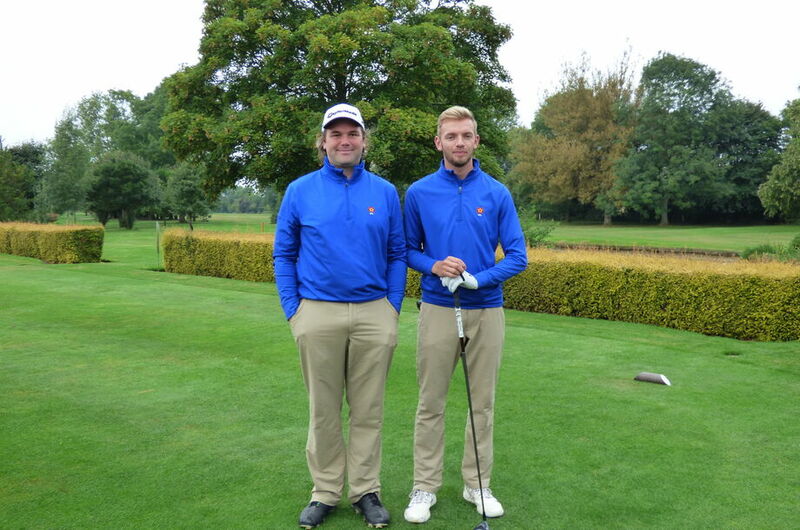 The final and decisive game of the Anglian league season took place and the well-presented Glen Gorse Golf Club on the outskirts of Leicester. Practise had taken place during the week and for four players on the Saturday afternoon prior to the matches. Sunday’s weather was cool, cloudy and increasing breeze throughout the day. With quick and slopey greens to contend with – the matches looked evenly set, though Glen Gorse would appear to be a course where some experience of the course would be advantageous. With 3 counties all still in with a real chance of completing league victory –Leicestershire required a victory and a Lincolnshire loss. Lincolnshire playing away in Suffolk required a loss for Northants and we required a win. One of the closest Anglian League finishes for many years. The Northamptonshire 8 were made up of Fraser Carnihan (Cold Ashby), Ryan Connolly (Wellingborough), Callum Farr (Priors Hall), Mikey Chambers (Overstone Park), Tom Bullough & Liam McNeela (Northants County), Lewis White (Northampton) and Miles Mudge (Staverton). A team with a lovely blend of youth and experience – while admittedly missing a few key players to International duty, return to University and holidays. The morning foursomes began, with Callum Farr and Mikey Chambers opening for Northants against Coby Cartwright and Chris Brook. This match was effectively decided on the greens with Coby holing his ‘fair share’ and our pair not doing the same. A 3&1 defeat would be the eventual outcome in this one, despite some excellent golf from tee to green from both pairs. 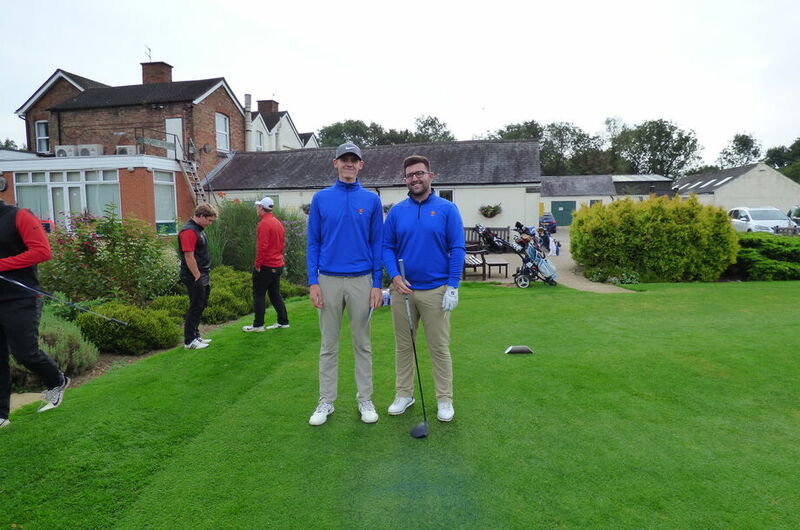 In match 2 Fraser Carnihan and Miles Mudge’s opponents Jack Mayfield and Scott Wormleighton would get off the a flyer, 4 birdies in the first holes saw them open up a 4 hole advantage through 6 holes. As you would expect from the Northants pair, their never say die attitude would see holes clawed back at regular intervals. 2 down thru 11 and 1 down thanks to a birdie at the 13th hole. A fantastic birdie up the long par 17th saw the match return to all square. Two excellent shots into the equally long 18th and the Northants pair would have the chance to win the match with Leicestershire failing to get up and down for 4. However, our boys would fail to make par following a very quick, downhill putt slipped by and the return putt missed. The resulting half would have been taken if offered early in the match, but this felt like a half point lost in the end. Credit to Mudgie and Fraser for their fight back! 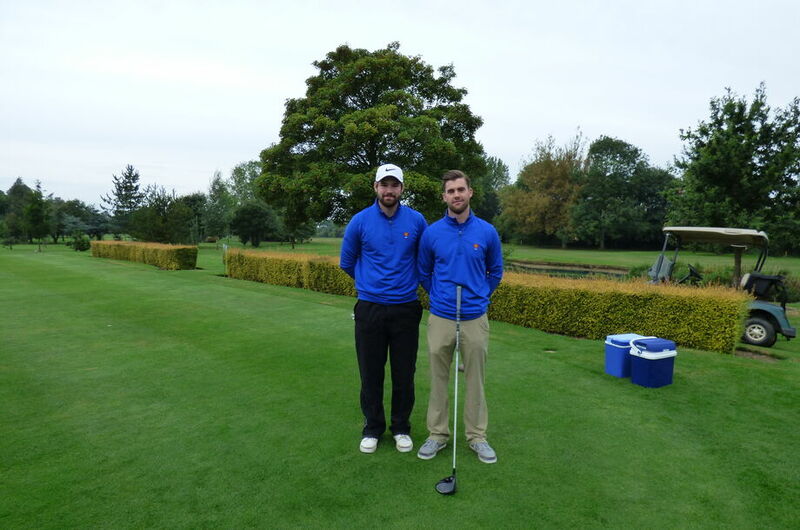 Third match on the course a new pairing for Northants with Liam McNeela returning to the side having missed the last two matches, partnering Tom Bullough, retaining his place following two impressive wins in the previous match. This match began in Northants favour with a couple of birdies in the first 4 holes, to take a 3 hole advantage. By the middle of the round this had been pegged back to 1up after 12. A birdie 4 on 13 returned Northants to 2 up, however with errors from both pairs on the increasingly difficult 14th hole, Leicestershire gained the hole and would again win 16th with a birdie to return the match to AS. So the match would again rest on the final 2 par 4’s both in excess of 450 yards. Liam’s drive on 17 would find a good spot on the fairway and Tom’s excellent approach into the green would finish close enough for a gimme – fantastic reply!! After another fantastic tee shot up the 18th from Tom, Liam’s well controlled wedge shot left Tom a simple 20 footer up the slope – in the end 2 putts were good enough to half the hole and win the match 1 up. Match 4 would see the best golf of the morning series. Lewis White and Ryan Connolly matched up against Leicestershire’s Captain Martin Anderson and Luke Burrows. These pairs traded birdies all morning, walking off the 16th green match all square – both pairs were 5 under par. Leicester’s captain said later in the day it was one of the best foursome matches he had been involved in for some time. Unfortunately after a couple of wayward tee shots on 17 and 18, the Northants lads would lose both holes and the match 2 down. A match of high quality deserved a better finish. So that left the morning scores 2.5-1.5 to Leicestershire and with news filtering through from Suffolk that Lincolnshire were leading 3-1 it was clear that a significant afternoon singles series was required from Northants to retain their chances at clinching only our third ever Anglian League title. The news from Suffolk probably meant the Leicestershire’s chances of winning the league had almost disappeared. After a short lunch break, players were back on the course with Fraser Carnihan (one of only 2 players that have played all 5 matches) matched up against Coby Cartwright in the first singles match. Occasionally you come up against a player that can do no wrong and this was the situation for Fraser on this afternoon. 3 birdies in the first 7, including 2 holed putts from in excess of 40 feet, Coby would carry on knocking in putts with Fraser playing very solid golf – the match would finish on the 13th green with the Leicester player 5 under par. In the increasingly difficult afternoon conditions, this was simply an excellent display of golf. In matches 2 and 3 Callum Farr and Liam McNeela provided a little youth at the top of the order. Callum’s match was very close through the first third of the round, while Liam got off to a slow start, mixed with some good play from his opponent and was 3 down after 7. Northants would lose the 7th hole, then followed 2 hole wins and 2 hole losses to be 1 down after 13. Callum would gain this deficit back by the 17th tee. Unfortunately one slightly misplaced tee shot would cost Callum and he went on to lose his match 1 down. In match 3, Liam was doing everything he could to turn his match around, he had gained one hole back to be 2 down through 13, but his opponent made the most ridiculous birdie on 14 from being well out of position after his tee shot, a second shot that would clatter trees, bounce short of and over a greenside bunker to leave a rapid, sideways breaking putt from 25 feet – which he holed! Liam’s excellent approach to 18 feet below the hole didn’t drop, resulting in a 3 hole deficit. To his credit Liam picked himself up quickly and promptly gained that hole straight back on 15, but needing birdies his approach shot on 16 would fall off the back of the green, leaving a devilish chip back – one he could not make up and down from and the match was lost. So the first three matches had gone to Leicestershire – leaving a miracle required…..
By this point the number of supporters (some past officials and captains) from Northamptonshire became evident to the captain, who had seconded himself at the far end of the course. In 15 years of playing county golf, I have never seen so many county supporters, this was great to see and I know much appreciated by all the players. 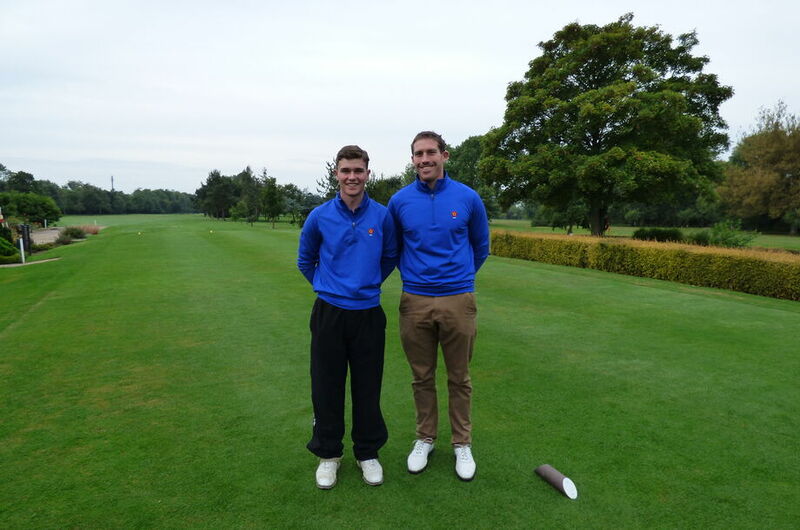 Mile Mudge was out 4 and Mudgie continued the excellent golf displayed in the practise round and morning foursomes matches – running out a 4 hole lead after 11 holes – obviously the investment in some modern technology was well worthwhile Miles! Despite one slightly (!!) wide tee shot, Miles would close his match out on the 16th green. An excellent performance from one of the counties most committed and dependable players. Lucky number 5 was Tom Bullough. Tom started well and opened up a 2 hole advantage over the front 9, with solid golf giving no easy holes away to his opponent. His two hole advantage lasted through 11 holes, then an opposition holed bunker shot for eagle followed by another hole win turned the match back to all square through 13 holes. On the 16th Tom’s second from the trees on the left handside, looked destined to be stiff, but with the wind beginning to blow stronger the ball pitched on the back edge and bounded out of bounds! A deflating blow to Tom’s and possibly the teams chances….this bad fortune would eventually lead to a loss, 1 down. Tom’s first loss for the county. At 6, Mikey Chambers, the second of our ever present players for the 2017 season. Mikey looked to be battling both his opponent and his game over the opening holes. Despite this he managed to get through the first 7 holes at all square. Though 1 down entering the back 9. He had got this back with two birdies at the back to back par 5’s and won 14 to finally get his nose in front. On 16 Mikey wisely played left of the hole position, which was very tricky. Putting to this location up the green, the putt was incredibly slopey and faster than expected with players throughout the day being caught out. Mikey’s play to the left side of the green paid off, as he holed a 30 footer across the green to turn his match to 2 up. Despite losing the 17th, Mikey would make an accomplished 4 on 18 to close his match out. This had been the Mikey’s first full season in the first team squad, with 6 wins from his 10 matches Mikey has had an excellent season and pays off the work he has put in on his game but also the strength and conditioning work with Prevail, over the winter months. In matches 7 and 8, Ryan and Lewis potentially had the pressure of the whole season on their shoulders. Again, both players started their matches well, both being 2 up after 6 holes. At this point in the day, with the first matches comfortably around the turn it became increasingly obvious that the overall result would be very close and pressure was building. While Ryan’s advantage extended to 3 up after 8, Lewis was pegged back to 1 up at the end of the front 9 – in another match against Martin Anderson that was flush with birdies. On the day attention turned away from the 2 lads at the back as earlier matches began to finish. When we next heard from Ryan, his advantage had been swallowed up thanks to a succession of stunning iron and wedge approaches from his opponent – 3 gimme birdies in the space of 5 holes. Lewis continued his match trading holes all the way. With both matches all square after 16 holes it became clear that the final result would be the odd point too far for Northants. Lewis played an exquisite bunker shot on 17 to save par, which was not matched for a 1 up advantage, Ryan playing the last, could not find the birdie putt to win his match. His opponent then holing a 10 footer to half the hole and match. Lewis would secure a par which was enough to win his match 1 up – probably a fair result over the day for Lewis and Martin who had done battle all day – one win a piece. The end result being a 7-5 victory for Leicestershire, meant neither team at Glen Gorse would win the league as news from Newton Green in Suffolk that Lincolnshire had won 9-3 securing their umpteenth league title. But with 8 of the 12 matches going down the last at Glen Gorse the outcome could so easily have been so much different!! This was an incredibly tight contest all day long. Despite the disappointment for the Northamptonshire players and supporters, it was important to remind the team of how far we have come over the season. We have been able to enjoy the commitment of players to the cause and their tenacity, desire, spirit and will to succeed has been evident all season. Not only that, but they are a great group socially, enjoy each others company and generally have a great time on county weekends. The Captain could not be prouder of all the players that have represented the county during 2017, 15 players in total have played Anglian League matches. This shows the depth of talent available to us, with the obvious success of the boys team to back that up. Northamptonshire County Golf is in a great place right now and has been the envy of many of our opponents this year! The future is bright – we may not have won the league this year – we’ll look back to the afternoon singles against Lincolnshire as the main reason for that – but we should contend strongly in the Anglian League over the next few years. As always, thanks to the support and background work done by Mike Gilbrook and Shane Rose, ensuring the players can focus 100% on playing golf on match days. And again thanks to the swell of support from Northamptonshire golfers, professionals and officials on the day. It would be nice to get everyone together at the Am-Am on the 13th of October at Kingsthorpe to see everyone before winter closes in and off season coaching programmes begin.